The following blogpost is from Avery Garon who led the publication of Radio Galaxy Zoo’s latest science result. Congratulations to Avery and team! Radio Galaxy Zoo is starting the new year strong, with another paper just accepted for publication. “Radio Galaxy Zoo: The Distortion of Radio Galaxies by Galaxy Clusters” will appear soon in The Astronomical Journal and is available now as a pre-print on the arXiv: https://arxiv.org/abs/1901.05480. This paper was led by University of Minnesota graduate student Avery Garon and investigates several ways in which the shape of a galaxy’s radio emission is affected by and informs us about the environment in which we find the galaxy. Like the previous RGZ paper, we are looking for how the radio tails extend into the hot plasma that fills galaxy clusters (the intracluster medium, or ICM). This time, we measure how much the two tails deviate from a straight line, marked in the example below by the value θ. The standard model is that the ICM exerts ram pressure on the galaxy as it travels though the cluster and causes its tails to bend away from the direction of motion. However, while individual clusters have been studied in great detail, no one has had a large enough sample of radio galaxies to statistically validate this model. Thanks to RGZ, we were able to observe the effect of ram pressure as a trend for the bending angle θ to increase for galaxies closer to the center of clusters (where the ICM density is higher) and in higher mass clusters (where the galaxies orbit with higher speeds). Example source RGZ J080641.4+494629. The magenta arrows extend from the host galaxy identified by RGZ users and terminate at the peaks of the radio emission, defining the bending angle θ. The cyan arrow is used to define an orientation for the galaxy with respect to the cluster. Because ram pressure causes the tails to bend away from the direction in which the galaxy is travelling, we can use this knowledge to map out the kinds of orbits that these galaxies are on. Unlike planetary orbits, which are nearly circular and all in the same plane, the orbits of galaxies in clusters tend to be randomly distributed in orientation and eccentricity. Our sample of bent radio galaxies shows an even more striking result: they are preferentially found in highly radial orbits that plunge through the center of their clusters, which suggests that they are being bent as their orbits take them through the dense central regions. Finally, we looked at radio galaxies that were far from clusters. Even though the median bending angle is 0° away from clusters, there is still a small fraction of highly bent galaxies out there. By counting the number of optical galaxies that are near the radio galaxies, we observed a sharp increase in the number of companions within a few hundred kiloparsecs of our bent radio galaxies. This suggests that even outside of true cluster environments, we are still observing bending induced by local overdensities in the intergalactic medium. On the 31 October 2018, Radio Galaxy Zoo published its first end-to-end machine learning system for “Classifying Radio sources Automatically using Neural networks” (ClaRAN). This paper is led by ClaRAN’s developer, Chen Wu, a data scientist at the International Centre for Radio Astronomy Research at the University of Western Australia (ICRAR/UWA), who repurposed the FAST-rCNN algorithm (used by Microsoft and Facebook) to classify radio galaxies. ClaRAN was trained on radio galaxies classified by Radio Galaxy Zoo and so recognises some of the most common radio morphologies that have been classified. The purpose of ClaRAN is to reduce the number of radio sources that require human visual classification so that future Radio Galaxy Zoo projects will have fewer “boring” sources, thereby increasing the chances of real discoveries by citizen scientists. ClaRAN (and its future cousins) are crucial for future surveys such as the EMU survey which is expected to detect ~70 million radio sources (using the Australian Square Kilometre Array Pathfinder telescope). While Radio Galaxy Zoo has made visual source classifications much more efficient, we will still need to reduce the total survey sample size to a sample for visual inspection that is less than 1% of the 70 million sources. How does ClaRAN work? ClaRAN inspects both the radio and coordinate-matched infrared overlay in the same fashion as RGZ Zooites, and then determines the radio source component associations in a similar fashion to the RGZ Data Release 1 (DR1) catalogue. As ClaRAN is still in its prototype stage (–analogous to the capabilities of a toddler), it only understands 3 main classes of radio morphologies — sources which have 1-, 2- or 3- separate radio components. ClaRAN was trained to understand these three different radio morphologies through seeing examples of all three classes from the RGZ DR1 catalogue. The animated gif (from the ICRAR press release) describes how ClaRAN “sees” the example radio galaxy. Please do not click on the link to the animated gif if you suffer from epilepsy or have any issues with flashing images. the more complex and exotic radio galaxy structures. For that to happen, we need to assemble much larger samples of more complex radio morphology classifications. With your support of Radio Galaxy Zoo, I am sure that we will get there. Fun fact: did you know that some of the more obscure bugs in the RGZ DR1 catalogue processing was actually found through training ClaRAN? This is because ClaRAN is a good learner and will learn all the small details that we didn’t initially notice. We only discovered these bugs through some of the funny answers that we got out of some of the early testing of ClaRAN. Classifying Galaxies from Another Universe! is the first Galaxy Zoo publication that examines visual morphological classifications of computer-generated galaxy images. The images were produced in collaboration with the international team of scientists who implemented and analyzed the highly sophisticated Illustris cosmological simulation (you can find many more details about Illustris on the main Illustris project website and about the Galaxy Zoo: Illustris project in this previous blog post). Illustris is designed to accurately model the evolution of our Universe from a time shortly after its birth until the present day. In the process, simulated particles of dark matter, gas, and stars aggregate and condense to form galaxy clusters that contain seemingly realistic galaxies. In our paper we wanted to test the realism of those simulated galaxies by inviting Galaxy Zoo volunteers to evaluate their morphological appearance. We wanted to know whether Illustris galaxies look like real galaxies. Is the galaxy simply smooth and rounded, or does it have features? This question represents one of the simplest ways to distinguish between different groups of galaxies, but its answer can reveal a lot of information about a galaxy’s history, as well as its current activity. Visible features and substructure like discs, spiral arms and bars in galaxy images often indicate sites of ongoing star formation and can provide evidence for complex dynamical processes within a galaxy. On the other hand, apparently featureless galaxies may have formed in dense environments where galaxy-galaxy interactions are more common and might act to destroy features or even prevent them from forming in the first place. In our paper, we compared the prevalence of visible features in galaxy images that were produced using Illustris against an equivalent sample of real galaxy images that were derived from Sloan Digital Sky Survey (SDSS) observations. Some of the differences we found were surprising but quite illuminating! Each image in Galaxy Zoo is classified by about forty volunteers and their votes for each question are aggregated to obtain a consensus. The level of agreement between volunteers can be quantified using the vote fraction for a particular response. For a particular image and question the vote fraction for a possible response is just the number of volunteers who voted for that response, divided by the total number of votes cast for that question, for that image. A concrete example that applies here is the “featured” vote fraction: the number of volunteers who classified a galaxy image as exhibiting visible features divided by the total number of votes cast for the simple question that was quoted above. Vote fractions close to zero indicate that most volunteers thought the galaxy was smooth and rounded, while vote fractions around one imply almost unanimous consensus that a galaxy has visible features. The filled green bars in Figure 1 illustrate the distribution of this “featured” vote fraction for real galaxy images. The distribution is dominated by a peak close to zero, which means that most volunteers thought that most galaxies looked smooth and featureless. There is also a smaller peak close to one, corresponding to a population of obviously featured galaxies. In contrast, the blue line shows the “featured” vote fraction for Illustris galaxy images. The bulk of the distribution is now peaked around 0.6, which means that Illustris galaxies were generally perceived to be predominantly featured. However, there are very few Illustris galaxies that were unanimously labeled as exhibiting visible features and a substantial population of visibly smooth galaxies is also present. Overall, the Illustris galaxy images seem more feature rich, but perhaps slightly more ambiguous than their SDSS counterparts. Figure 1: The distributions of the “featured” vote fraction for real (SDSS; Green, filled bars) and simulated (Illustris; Blue, hollow bars) galaxy images. There is an obvious mismatch between the distributions for the simulated and real galaxy images. To try to understand the origin of the mismatch between Illustris galaxies and those in the real Universe, we separated both of the image samples into three sub-groups based on the total mass of the stars that the galaxies contain (more succinctly described as their “stellar mass”). Each of the panels in Figure 2 can be interpreted in the same way as Figure 1, except that they correspond only to the galaxies for each of the three stellar mass sub-groups. The two panels to the left are for galaxies with stellar masses less than the mass of 1000 billion suns. They look remarkably similar to Figure 1 with the SDSS and Illustris distributions matching very poorly. However, the situation changes markedly in the right-hand panel. For these extremely massive galaxies, it appears that the Illustris simulation reproduces the observed proportion of visibly featured galaxies much better, although the population of unambiguously featured galaxies is still absent. Figure 2: The distributions of the “featured” vote fraction for real (SDSS; Green, filled bars) and simulated (Illustris; Blue, hollow bars) galaxy images. The distributions are shown for sub-groups of galaxies that are subdivided according to stellar mass. The distributions for the most massive galaxies, with stellar masses greater than the mass of 1000 billion suns, are shown in the right-hand panel. It is only for these very massive galaxies that the vote fraction distributions for simulated and real galaxies begin to look similar. The change in behavior with stellar-mass that we have identified might simply be an artifact of the finite resolution at which Illustris is able to simulate the Universe. Computational power is limited, so Illustris cannot accurately model the positions, interactions and evolution of every star in its simulation volume (and of course tracking individual gas atoms or dark matter particles is completely impossible!). Instead, Illustris models large groups of stars, and large accumulations of gas and dark matter as single “particles” and models the way that they interact with each other. The features that volunteers perceive in Illustris galaxy images manifest substructures formed by groups of many such particles. Simulated galaxies with larger stellar masses contain more stellar particles that enable the simulation to model finer structural details which may be necessary to emulate the appearance of real galaxies. Studies involving automatic morphological classification of Illustris galaxy images (e.g. Bottrell et al 2017, Snyder et al 2015) have also identified a marked divergence with galaxies in the real Universe below the same 1000 billion solar mass limit that we have found. Confirmation that the visual appearance of galaxies also changes perceptibly complements a growing body of knowledge on this subject. Dust is another constituent of galaxies that can substantially modify their appearance by absorbing bluer light that typically indicates star formation and re-emitting it at redder wavelengths. This dust reddening effect is not accounted for by the Illustris simulations and could obscure the visibility of features that are actually present in real galaxies. This means that Illustris might be modeling real galaxies better than it seems, and coupling of a dust reddening model to the simulation output might improve the correspondence between the mismatched vote fraction distributions at lower stellar masses. As is often the case in scientific research, an unanticipated result has provided valuable insight. The results from Galaxy Zoo: Illustris will help cosmologists to improve their models as they develop the next generation of large-scale simulations of our Universe. The results also underline the ongoing potential utility for visual morphological classification of simulated galaxies. The most recent cosmological simulations, including a next-generation Illustris Simulation, address many of the shortcomings that this and other studies have revealed. Comparing their outputs with SDSS galaxy images, as well as observational data produced by other surveys, will undoubtedly yield more insights into the processes that govern the formation and evolution of galaxies. Watch this space! A preprint of the new paper, which has been accepted by the Astrophysical Journal, can be downloaded from the arXiv. Radio Galaxy Zoo finds rare HyMoRS! The following blogpost is from Anna Kapinska about the Radio Galaxy Zoo paper that she published recently with Radio Galaxy Zooite, Ivan Terentev on the first sample of candidate Hybrid Morphology Radio Sources (HyMoRS) from the 1st year of Radio Galaxy Zoo results. But what are HyMoRS? HYbrid MOrphology Radio Sources, HyMoRS or hybrids for short, are peculiar radio galaxies that show atypical radio morphologies. That is, radio galaxies which we can resolve in our observations come in two principal flavours: 1) FRI – type; and 2) FRII-type — named after two scientists who introduced this classification back in 1974, Berney Fanaroff and Julia Riley [link to paper]. Figure 1. Three main types of radio galaxies. FRI type (3C 296, left panel), FRII type (3C 234, right panel), and a HyMoRS that shows a hybrid radio morphology of FRI on its eastern (left) side and FRII on its western (right) side (RGZ J103435.8+251817, middle panel). The radio emission from the jets is in blue, overlaid on the SDSS true colour images. Credits: Kapinska (based on FIRST/NRAO, SDSS, Leahy+Perley 1991). Traditionally, FRIs and FRIIs are distinguished by different morphologies observed in radio images, where on the one hand we have archetypal FRIIs showing powerful jets that terminate in so-called hotspots (can be spotted in right panel of Figure 1 as two white bright spots at the ends of the jets), while on the other there are FRIs with their jets often turbulent and brightest close to the host galaxy and its supermassive black hole (left panel of Figure 1). HyMoRS are hybrids, they show both morphologies at the same time, that is they look like FRI on one side and FRII on the other side. Figure 2 shows two examples of the new HyMoRS candidates that Radio Galaxy Zoo identified in this latest paper. Figure 2. Two new HyMoRS candidates found with Radio Galaxy Zoo: RGZ J150407.5+574918 (left) and RGZ J103435.8+251817 (right). The radio emission from the jets is in blue overlaid on the SDSS true colour images. The inserts show zoom-ins on the HyMoRS’s SDSS images of the hosts galaxies. Credits: Kapinska (based on FIRST/NRAO, SDSS). How are HyMoRS formed? We still don’t have a very clear answer to this question. The thing is that there may be many reasons why one radio galaxy would have so radically different looking jets. One possibility is that the medium in which the jets travel through (the space around) is different on each side of the galaxy. In this case the FRI morphology could form if the medium is dense or clumpy for one jet, while FRII morphology could form if the medium is smoother or less dense on the other side for the second jet (but watch this space for more work from our science team). But there are also other options. For example, we may simply see the radio galaxy in projection, or we are observing rare events of a radio galaxy switching off, or switching off and on again. The more HyMoRS we know of, the better we can study them and pinpoint the scenarios of how they form. For example, the science team at the University of Tasmania has produced a simulation of jets from an FRII-type radio galaxy located in the outer regions of a cluster (~550 kpc from the centre) and expanding in a non-uniform cluster environment. The jet on one side propagates into a much denser medium than the jet on the other side. The jets are very powerful (10^38 Watts) and the total simulation time is 310 Myr. The movies display the density changes associated with the jet expansion. Credit goes to Katie Vandorou, Patrick Yates and Stas Shabala for this simulation (link to simulation). The following blogpost is from Omar Contigiani about the Radio Galaxy Zoo paper that he published recently on the cosmic alignment of radio sources. In the Radio Galaxy Zoo an incredible variety of creatures can be found — as our citizen scientists might know by now, radio sources in the sky can have all sorts of shape and sizes. The most powerful among them are plasma-filled jets emitted by the some of the largest elliptical galaxies in existence. Because of their precise structure, anyone can associate orientations to these sources by simply looking at the directions the jets point at. Figure 1: Illustration of jet orientations distributed in the sky. Note that this figure only depicts a small fraction of the total area covered by the observations upon which RGZ is based. Credit: NASA, ESA, S. Baum & C. O’Dea (RIT), R. Perley & W. Cotton (NRAO/AUI/NSF). Recently, our scientists have been looking at the directional properties of these fascinating beasts. If a particular source points in a direction, is it possible that its neighbours also tend to do the same? Because the distances between adjacent objects are (quite literally) astronomical, it seems intuitive to assume that the relative orientations should be random. However, nature always finds subtle ways to mess with our intuition and it turns out that this is currently an open question in astronomy. Thanks to Radio Galaxy Zoo’s numerous (almost two million) image classifications, the team was able to report the most precise measurement of this effect to date. The results are available in a scientific article published in Monthly Notices of the Royal Astronomical Society this November. The analysis performed in the study suggests that relative alignment of radio sources is present on distances which are dubbed as cosmological. This is because only phenomena related to the history of the Universe as a whole are known to be connected to such large scales. While this is an exciting step towards an answer, formulating any conclusive statement about this alignment and the reasons behind it appears to be difficult. What drives this effect? Is it related to a shared history or environment? More science needs to be done and more galvanising discoveries are waiting for us just around the corner. Once again, without the contributions made by our volunteers all over the world, we would not have been so successful in our endeavours. A big thank you to all our Radio Galaxy Zooites! However, we have only reached 74% of our classification target. Head to Radio Galaxy Zoo to become involved and you will be contributing to real science being done today and may be co-authoring another great discovery with us! It is my pleasure to announce the launch of a brand new Zooniverse project: Galaxy Nurseries. By taking part in this project, volunteers will help us measure the distances of thousands of galaxies, using their spectra. Before I tell you more about the new project and the fascinating science that you will be helping with, I have an announcement to make. Galaxy Nurseries is actually the 100th Zooniverse project, and we’re launching it in the year that Galaxy Zoo (the project that started the Zooniverse phenomenon) celebrates its 10 year anniversary. We can’t think of a better birthday present than a brand new galaxy project! To celebrate these watersheds in the histories of the Zooniverse and Galaxy Zoo, we’re issuing a special challenge. Can you complete Galaxy Nurseries – the 100th Zooniverse project – in just 100 hours? We think you can do it. Prove us right! Back to the science! What is Galaxy Nurseries? The main goal of this new project is to discover thousands of new baby galaxies in the distant Universe, using the light they emitted when the Universe was only half of its current age. Accurately measuring the distances to these galaxies is crucial, but this is not an easy task! To measure distances, images are not sufficient, and we need to analyze galaxy spectra. A spectrum is produced by decomposing the light that enters a telescope camera into its many different colors (or wavelengths). This is similar to the way that water droplets split white light into the beautiful colors of a rainbow after a storm. The data that we use in this project come from the WISP survey. The “WISP” part stands for WFC3 IR Spectroscopic Parallel. This project uses the Wide Field Camera 3 carried by the Hubble Space Telescope to capture both images and spectra of hundreds of regions in the sky. These data allow us to find new galaxies (from the images) and simultaneously measure their distances (using the spectra). This animation shows how a galaxy’s white light going through a prism gets decomposed into all its colors. Like the rainbow! The figure shows how the different colors end up in different positions. In this example violet/blue toward the bottom, orange/red toward the top. At each color, we have an image of the galaxy. When we sum the intensity at any given color, we obtained the spectrum to the right. How do we do that? We need to identify features called “emission lines” in galaxy spectra. Emission lines appear as peaks in the spectrum and are produced when the presence of certain atomic elements in a galaxy (for example oxygen, or hydrogen), cause it to emit light much more strongly at a specific wavelength. The laws of physics tell us the exact wavelengths at which specific elements produce emission lines. We can use that information to tell how fast the galaxy is moving away from us by comparing the color of the emission line we actually measure with the color we know it had when it was produced. In the same way that the Doppler effect changes the apparent pitch of an ambulance’s siren as it approaches or recedes, the apparent color of an emission line depends on the speed of the galaxy that produced it. Then, we can relate the speed of the receding galaxy to how far it is from us through Edwin Hubble’s famous law. The real trick is finding the emission line features in the galaxy spectra. Like many modern scientific experiments, we have written computer code that tries to identify these lines for us, but because our automatic line finder is only a machine, the code produces many bogus detections. It turns out that the visual processing power and critical thinking that human beings bring to bear is ideally suited for filtering out these bogus detections. By helping us to spot and eliminate the false positives, you will help us find galaxies that are some of the youngest and smallest that have ever been discovered. In addition, we can use your classifications to create a next-generation galaxy and line detection algorithm that is much less susceptible to being fooled and generating spurious detections. All your work will also be very valuable for the new NASA WFIRST telescope and for the ESA/NASA Euclid mission, which both will be launched in the coming decade. Emission lines in a galaxy’s spectrum can tell us about much more than “just” its distance. For example, the presence of hydrogen and oxygen lines tells us that the galaxy contains very young, newborn stars. Only these stars are hot enough to warm the surrounding gas to sufficiently high temperatures that some of these lines appear. By examining emission lines we can also learn what kind of elements were already present and in what relative proportions. We too are “star-stuff”, and by looking at these young galaxies we are following the earliest formation of the elements that make all of us. The horizontal rainbows show the spectra for the three objects on the left. The bottom, very compact object is a star in our own Milky Way. The other two objects are an interacting pair of young galaxies, observed as they were 7 billion years ago! We can say this because we see an emission line from hydrogen in both galaxies (indicated with arrows). This emission line allows us to measure the galaxies’ distances. Just in time to brighten our holiday season, we got word that the Astrophysical Journal has accepted out next paper on the Voorwerpje clouds around fading active galactic nuclei (AGN). The full paper is now linked on the arXiv preprint server. This time, we concentrated on the clouds and what they can tell us about the history of these AGN. To do this, we worked pixel-by-pixel with the Hubble images of the clouds in the H-alpha and [O III] emission lines, augmented by a new (and very rich) set of integral-field spectroscopy measurements from the 8-meter Gemini North telescope, velocity maps from the Russian 6-meter telescope, and long-slit spectra from the 3-meter Shane telescope at Lick Observatory. To examine the history of each AGN, our approach was that the AGN had to be at least bright enough to ionize the hydrogen we see glowing at each point at the time the light reaching that point was given off. Certainly we can’t expect each piece of the cloud to absorb all the deep-UV radiation, so this is a lower limit. Two external checks, on quasars unlikely to have faded greatly and on the Teacup AGN which has had detailed modeling done from spectra, suggests that the very brightest pixels at each radius absorb comparable fractions of the ionizing radiation. This gives confidence that we can track at least the behavior of a single object, underestimating its brightness by a single factor, if we look at the upper envelope of all pixels in the H-alpha images. We hoped this would be feasible all the way back to the original Hubble proposal to look at Hanny’s Voorwerp. Here is a graphic from the new paper comparing our AGN in this way. The distance in light-years at each point corresponds to the time delay between the AGN and cloud, and the curve labelled “Projection” shows how much one of these points would change if we view that location not perpendicular to the light but at angles up to 30 degrees each way. To be conservative, the plot shows the data corresponding to the bottom of this curve (minimum AGN luminosity at each point). The common feature is the rapid brightness drop in the last 20,000 years for each (measured from the light now reaching us from the nuclei). Before that, most of them would not have stood out as having enough of an energy shortfall to enter our sample. Because of smearing due the large size of the clouds, and the long time it takes for electrons to recombine with protons at such low densities, we would not necessarily see the signature of similar low states more than about 40,000 years back. We could also improve another measure of the AGN history – the WISE satellite’s mid-infrared sky survey gave us more accurate measure of these objects’ infrared output. That way, we can tell whether it is at least possible for the AGN to be bright enough to light up the gas, but so dust-blocked in our direction that we underestimate their brightness. The answer in most cases is “not at all”. New data brought additional surprises (these objects have been gifts that just keep on giving). The Gemini data were taken with fiber-optic arrays giving us a spectrum for each tiny area 0.2 arcseconds on a side (although limited to 3.5×5 arc second fields), taken under extraordinarily steady atmospheric conditions so we can resolve structures as small as 0.5 arc second. We use these results to see how the gas is ionized and moves; some loops of gas that earlier looked as if they were being blown out from the nuclei are mostly rotating instead. Unlike some well-studied, powerful AGN with giant emission clouds, the Voorwerpje clouds are mostly just orbiting the galaxies (generally as part of tidal tails), being ionized by the AGN radiation but not shoved around by AGN winds. This montage shows the core of NGC 5972 seen by these various instruments, hinting at the level of mapping allowed by the Gemini spectra (and helping explain why it took so long to work finish the latest paper). Work on the Voorwerpjes continues in many ways. Galaxy Zoo participants still find possible clouds (and the moderators have been excellent about making sure we see them). There is more to be learned from the Gemini data, while X-ray observatories are gradually bringing the current status of the AGN into sharper focus. A narrowband imaging survey from the ground can pick out fainter (and sometimes older) clouds. Colleagues with expertise in radio interferometry are addressing questions posed by the unexpected misalignments of optical and radio structures in some of our galaxies. Finally, the new DECaLS and Pan-STARRS survey data will eventually bring nearly the whole sky into our examination (for a huge range of projects, not just AGN history). Once again, thanks to all who have helped us find and unravel these fascinating objects! We submitted the Galaxy Zoo CANDELS paper in May. Now, after some discussion with a very helpful referee, the paper is accepted! I hope our volunteers are as thrilled as I was to get the news. It happened within days of the Galaxy Zoo: Hubble paper acceptance. Hurray! Spot the typo! (No, just kidding.) (Well, sort of. There is one, but it’s not easy to find and it’s pretty inconsequential.) This is not quite the longest paper I’ve ever written, but it is the longest author list I’ve ever been at the top of. It includes both Galaxy Zoo and CANDELS scientists. And the volunteers are acknowledged too, in that first footnote. A lot of people did a lot of work to bring this together. If you’d like to read the paper, it’s publicly available as a pre-print now and will be published at some point soon in the Monthly Notices of the Royal Astronomical Society. The pre-print version is the accepted version, so it should only differ from the eventual published paper by a tiny bit (I’m sure the proof editor will catch some typos and so on). We collected 2,149,206 classifications of 52,073 subjects, from 41,552 registered volunteers and 53,714 web browser sessions where the classifier didn’t log in. In the analysis we assumed each of those unique browser sessions was a separate volunteer. Most subjects have 40 classifications apiece, although some were retired early from active classification and others were classified further, until about 80 volunteers per galaxy had told us what they thought. The raw consensus classifications are definitely useful, but we also weighted the classifications using a combination of “gold standard” data and consensus-based weighting. That is, classifiers were up- or down-weighted according to whether they could tell a galaxy apart from a star most of the time, and then the rest of the weighting proceeded in the same way it has for every other GZ dataset. No surprise: the majority of volunteers are excellent classifiers. 6% of the raw classifications were from 86 classifiers who both classified a lot and gave the same answer (usually “star or artifact”) at least 98% of the time, no matter what images they saw. We have some bots, but they’re quite easy to spot. Even with a pretty generous definition of what counts as “featured”, less than 15% of galaxies in the relatively young Universe that this data examines have clear signs of features. Most galaxies in the data set are relatively smooth and featureless. Galaxy Zoo compares well with visual classifications of the same galaxies done by members of the CANDELS team, despite the fact that the comparison is sometimes hard because the questions they asked weren’t the same as what we did. This is, of course, a classic problem when comparing data sets of any kind: to some extent it’s always apples-vs-oranges, and the devil is in the details. We devote an entire section of the paper to comparing with the CANDELS-team classifications (from Kartaltepe et al. 2015, which we abbreviate to K15 in the paper). The bottom line: the classifications generally agree, and where they don’t we understand why. Sometimes it’s because there’s interesting science there, like mergers versus overlaps. The greyscale shading is a 2-D histogram; the difference in the blue versus red points is in which axis was used to separate the galaxy into bins so that the average trends could be computed. By combining Galaxy Zoo classifications with multi-wavelength light profile fitting — where we fit a 2D equation to the distribution of light in a galaxy, the properties of which correlate pretty well with whether a galaxy has a strong disk component — we’ve identified a population of likely disk-dominated galaxies that also completely lack the features that are common in disk galaxies in the nearby, more evolved Universe. These disks don’t have spiral arms, they don’t have bars, they don’t have clumps. They’re smooth, but they are disks, not ellipticals. They tend to be a bit more compact than disk galaxies that do have features, even though they’re at the same luminosities. They’re also hard to identify using color alone (which echoes what we’ve seen in past Galaxy Zoo studies of various different kinds of galaxies). You really need both kinds of morphological information to reliably find these. The data is available for download for those who would like to study it: data.galaxyzoo.org. With the data releases of Galaxy Zoo: Hubble and Galaxy Zoo CANDELS added to the existing Galaxy Zoo releases, your combined classifications of over a million galaxies near and far are now public. We’ve already done some science together with these classifications, but there’s so much more to do. Thanks again for enabling us to learn about the Universe. This wouldn’t have been possible without you. Galaxy Zoo: Hubble – data release and paper accepted! I’m incredibly happy to report that the main paper for the Galaxy Zoo: Hubble project has just been accepted to the Monthly Notices of the Royal Astronomical Society! It’s been a long road for the project, but we’ve finally reached a major milestone. It’s due to the efforts of many, including the scientists who designed the interface and processed the initial images, the web developers who managed our technology and databases, more than 80,000 volunteers who spent time classifying galaxies and discussing them on the message boards, and the distributed GZ science team who have been steadily working on analyzing images, calibrating data, and writing the paper. The preprint for the Galaxy Zoo: Hubble paper is available here. The release of GZH also syncs up with the publication of the Galaxy Zoo: CANDELS catalog, led by Brooke Simmons; she’ll have a blog post up later today, and the GZC paper is also available as a preprint. The first page of the project description and data release paper for Galaxy Zoo: Hubble (Willett et al. 2016). Galaxy Zoo: Hubble began in 2010; it was the first work of GZ to move beyond the images taken with the Sloan Digital Sky Survey (SDSS). We were motivated by the need to study the evolution and formation of galaxies billions of years ago, in the early days of the Universe. While SDSS is an amazing telescope, it doesn’t have the sensitivity or resolution to make a quality image of a typical galaxy beyond a redshift of about z=0.4 (distances of a few billion parsecs). Instead, we used images from the Hubble Space Telescope, the flagship and workhorse telescope of NASA for the past two decades, and asked volunteers to help us classify the shapes of galaxies in several of Hubble’s largest and deepest surveys. After more than two years of work, the initial set of GZH classifications were finished in 2012 and the site moved on to other datasets, including CANDELS, UKIDSS, and Illustris. So why has it taken several years to finish the analysis and publication of the data? The reduction of the GZH data ended up being more complicated and difficult than we’d originally anticipated. One key difference lies in our approach to a technique we call debiasing; these refer to sets of corrections made to the raw data supplied by the volunteers. There’s a known effect where galaxies that are less bright and/or further away will appear dimmer and/or smaller in the images which are being classified. This skews the data, making it appear that there are more elliptical/smooth galaxies than truly exist in the Universe. With SDSS images, we dealt with this by assuming that the nearest galaxies were reliably measured, and then deriving corrections which we applied to the rest of the sample. In Galaxy Zoo: Hubble, we didn’t have that option available. The problem is that there are two separate effects in the data that affect morphological classification. The first is the debiasing issue just mentioned above; however, there’s also a genuine change in the populations of galaxies between, say, 6 billion years ago and the present day. Galaxies in the earlier epochs of the Universe were more likely to have clumpy substructures and less likely to have very well-settled spiral disks with features like bars. So if we just tried to correct for the debiasing effect based on local galaxies, we would have explicitly removed any of the real changes in the population over cosmic time. Since those trends are exactly what we want to study, we needed another approach. Our solution ended up bringing in another set of data to serve as the calibration. Volunteers who have classified on the current version of the site may remember classifying the “FERENGI” sample. These were images of real galaxies that we processed with computer codes to make them look like they were at a variety of distances. The classifications for these images, which were completed in late 2013, gave us the solution to the first effect; we were able to model the relationship between distance to the galaxy and the likelihood of detecting features, and then applied a correction based on that relationship to the real GZH data. Top: Example of a galaxy image processed with FERENGI to make it appear at a variety of distances. Bottom: Calibration curves based on FERENGI data that measure the effect of distance on morphological classification. From Willett et al. (2016). The new GZH data is similar in format and structure to the data release from GZ2. The main product is a very large data table (113,705 rows by 172 columns) that researchers can slice and dice to study specific groups of galaxies with morphological measurements. We’re also releasing data from several related image sets, including experiments on fading and swapping colors in images, the effect of bright active galactic nuclei (AGN), different exposure depths, and even a low-redshift set of SDSS Stripe 82 galaxies classified with the new decision tree. All of the data will be published in electronic tables along with the paper, and are also downloadable from data.galaxyzoo.org. Our reduction and analysis code is available as a public Github repository. The science team has already published two papers based on preliminary Galaxy Zoo: Hubble data. This included a paper led by Edmond Cheung (UCSC/Kavli IPMU) that concluded that there is no evidence connecting galactic bars and AGN over a range of redshifts out to z = 1.0. Tom Melvin (U. Portsmouth) carefully examined the overall bar fraction in disks using COSMOS data, measuring a strong decrease in bar fraction going back to galaxies 7.8 billion years ago. We’re now excited to continue new research areas, including a project led by Melanie Galloway (U. Minnesota) on the evolution of red disk galaxies over cosmic time. We hope GZH will enable a lot more science very soon from both our team and external researchers, now that the data are publicly released. A massive “thank you” again to everyone who’s helped with this project. Galaxy Zoo has made some amazing discoveries with your help in the past eight years, and now that two new unique sets of data are openly available, we’re looking forward to many more. 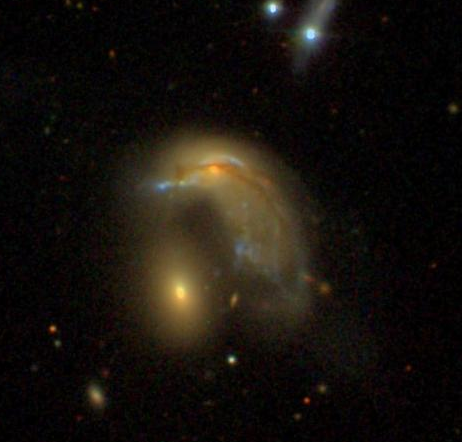 Once upon a time, there was an experimental project called Galaxy Zoo: Mergers. It used ancient, mystical technology to allow volunteers to run simulations of merging galaxies on their computers, and to compare the results of many such simulations. Their mission: to find matches to more than fifty nearby mergers selected from Galaxy Zoo data. The wonderful Penguin Galaxy, studied in the project. Amongst the chosen galaxies were not just run-of-the-mill, everyday mergers, but also the various oddities that the volunteers found, such as the Penguin galaxy. The team led volunteers through a series of tournaments designed to pit potential solutions for a particular galaxy against each other. In total, more than 3 million simulations were reviewed producing the results described in the paper, now accepted by the journal MNRAS, and in the dataset visible at the main Galaxy Zoo data repository. This represents a huge amount of effort, and a speeding up of the process – in the paper, we note that previous fits to mergers have taken months of effort to complete. This is by far the most complex project I have ever worked on. Most papers that model interacting galaxies contain one or two systems where the author uses a few dozen simulations. We just published a paper that modeled 62 different systems using a brand new modeling technique where the 3 million simulation results were reviewed by citizen scientists. Best of all, the 62 models were done using the same code and the same coordinate system so others can reproduce them. Doing this with other published simulations is nearly impossible. I know an immense amount of effort went into making sure that the results weren’t wasted, and the paper thus represents a happy ending to a tale that’s been running a long time. But it is not really an end; we are already planning to observe some of these galaxies as part of surveys like MaNGA that can measure the way that the galaxies’ components are moving today, allowing us to test these models. We also hope a library of models might be useful for other astronomers, and will be looking to try and revive this kind of project. Read more about Galaxy Zoo: Mergers in this old blog post blog.galaxyzoo.org/2012/03/27/the-finale-of-merger-zoo.